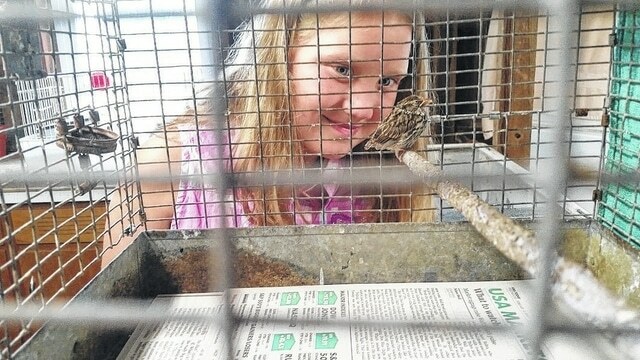 Addison VanTilburg of Bellville smiles at a chipping sparrow she was able to help save Monday in Galion. A love of animals and a determination to not allow a living thing to die led a Bellville girl to take extra measures to save a chipping sparrow’s life Monday afternoon in Galion. Addison VanTilburg, who is entering the fifth grade at Bellville Elementary this fall, and her mother, Amy, were visiting Goodwill in Galion following a sleepover at a cousin’s house in Crestline. Shortly afterwards, the family saw it. And quickly, Amy realized that her daughter wasn’t ready to leave. “She was determined and said she wasn’t leaving,” Amy said. “It would have died without help,” Addison added. Quickly, others got involved and wanted to help. The family called police and officers John Bourne and Josiah Bauer arrived on the scene to help. Amy said one of the officers jumped into the drain and was able to pick the bird up in a glove and the family placed the bird for safekeeping. Addison said she was happy for the help of the officers. “They were my heroes,” she said. Amy shared that Addison has had a tough time since the death of her father, Ben, three years ago and is sensitive about death. The family transported the bird to Wildlife Haven, a non-profit rehabilitation center in Crestline. Addison, an animal lover, said she was happy to help. “I’m excited I was able to get it out of there,” she said. Amy said they were able to talk to Schnelker about the bird, who is 12 days old, on Tuesday and was able to visit for the first time on Wednesday. Addison was excited to see the bird again. Schnelker said the bird should be OK.